When I was in elementary school, my friend Suzanne and I would spend hours pawing through her older brother’s stash of Cracked magazines. The “grown up” humor seemed titillating and, next to looking at the naked people in Natural Geographic magazine, it was a taboo that I dared not let anyone else know I enjoyed. I was a seriously innocent country kid who was naive to most everything and, even though I’m sure I had no clue what most of the articles “really” meant, I still found them hysterical. Still do! Well, Cracked, like the rest of the world, is online now and the humor website gets 300 million page views each month. They spoof and laugh at movies, video games, world news, history, science, tech, music… human nature. 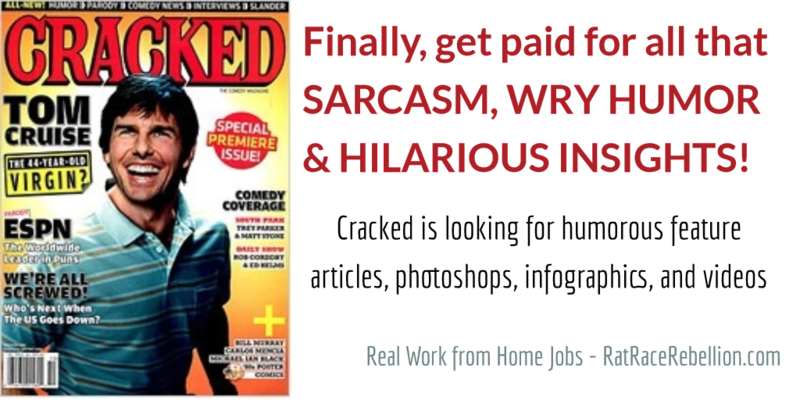 That’s a huge audience and Cracked is looking for smart, witty people like YOU to help keep them entertained. No experience is necessary, unless you count the life experience that has gifted you with your unique way of looking at the world! So, whether you are the “life of the party” funny person, the one with the “quiet wry” sense of humor, or the modern day Mark Twain who just has a way with words, Cracked wants to hear from you. They are looking not only for feature writers, but also for photoshoppers (to create humorous manipulated photos), infographics creators (even if you only have a great idea – they’ll buy it and create the graphic themselves), and funny videos. Click here to learn more about what they are looking for! This entry was posted in Work at Home Jobs, Writing & Blogging and tagged humor, photoshop, video. Bookmark the permalink.